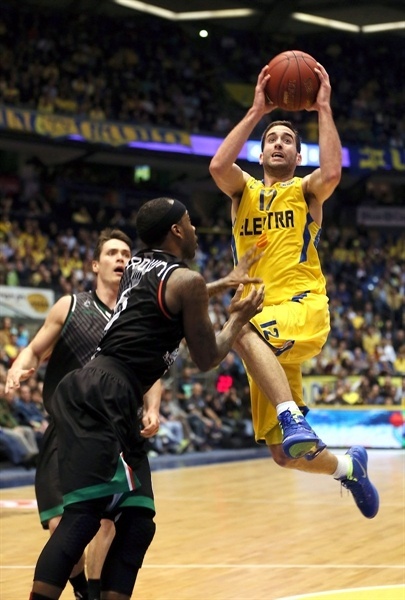 Maccabi Electra rejuvenated its playoffs hopes with a 92-61 pasting off Montepaschi Siena on Thursday night at Nokia Arena in Tel Aviv. Devin Smith and Yogev Ohayon each scored 19 to pace the Israeli champs, who improved to 3-5 in Top 16 Group F. The result knocked Siena to 6-2 as it dropped from a share of first place in the standings. 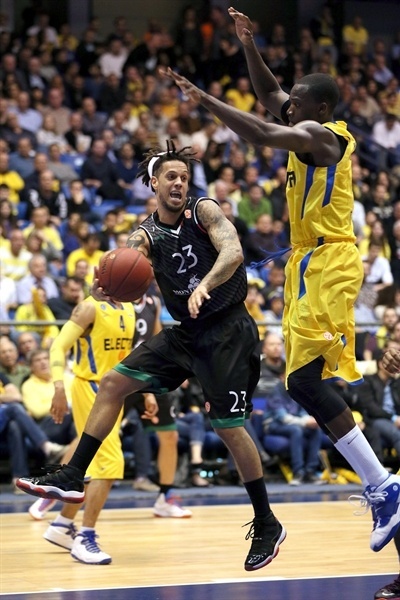 After an even opening quarter, Smith and David Logan led a 14-3 second-quarter run that put the Israeli champs up by 10 at halftime. The lead reached 20 in the third quarter. After Siena center Benjamin Eze helped narrow the gap to 12 early in the fourth quarter, Maccabi took off behind Smith and Guy Pnini, reeling off 21 unanswered points to secure the win. 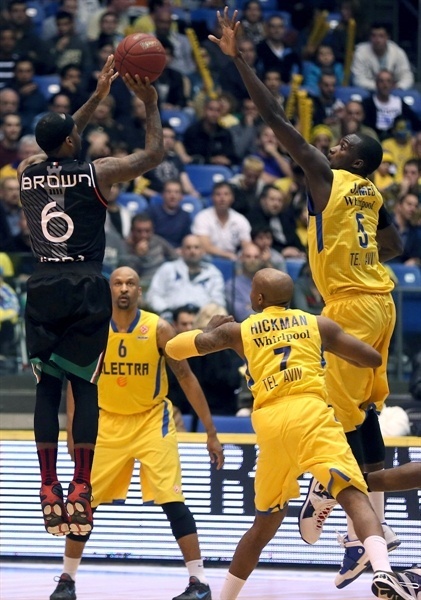 Smith was 5 for 6 from downtown as Maccabi made 60% of its three-pointers. Pnini finished with 15 points for the winners, Logan scored 14 and Shawn James compiled 14 points and 4 blocked shots. Bobby Brown and Kristjan Kangur each scored 13 for Siena. Smith put the hosts up with a triple for the game’s first basket. James scored on the break before Brown and Kangur got Siena on the scoreboard. Eze tied it at 6-6, but Maccabi never fell behind. After a pretty Ohayon layup, Logan drilled a three to make it 13-8. Kangur brought the Italian champs back with a pair of three-pointers – one from each corner – to even the score at 14-14. Ohayon put the hosts right back on top with a three, but Kangur’s 10th point of the quarter gave Siena its first lead, 17-18. The lead changed hands on each of the next three possessions before Brown’s second-chance bucket tied it at 22-22 through one quarter. The defenses toughened up at both ends after a free-flowing finish to the first quarter. Brown and Ohayon scored to keep it tied. Turnovers by each team’s center, Eze and Darko Planinic, kept the score stagnant. Pnini’s layup made it 27-26 midway through the quarter. 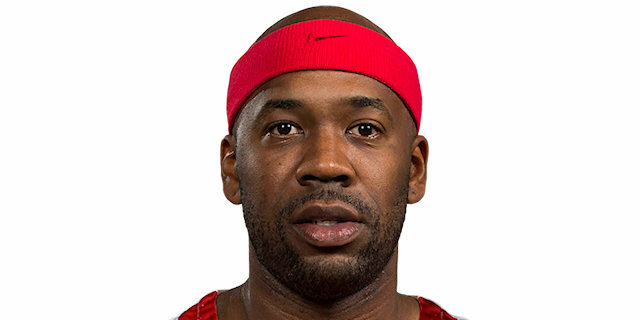 Ricky Hickman got a shooter’s roll on a triple. Viktor Sanikidze brought the visitors within 2, but Maccabi grabbed the momentum. James scored inside, Hickman penetrated for a layup and Pnini nailed a triple to make it 37-28. 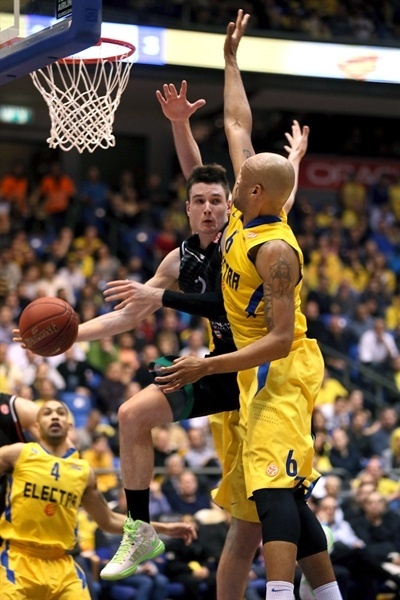 Daniel Hackett countered with a three, however Logan and Smith soon boosted the Tel Aviv advantage to double figures. Logan found Smith for a triple from the corner as the Nokia Arena crowd roared in appreciation. David Moss countered with a three-pointer, but Smith sank a pair of free throws with 1.1 seconds left in the half to make it 46-34 at the break. Ohayon further extended the lead with a layup to open the second half and then added a three-pointer. James wowed the crowd with a basket-plus-foul on back-to-back trips down the court, though he missed the free throws each time. Nevertheless, after a 9-1 start to the half, the Maccabi lead stood at 20. Moss countered with a triple. Then Pnini and Kangur traded threes. Ohayon went coast to coast for a layup and a 60-41 lead midway through the quarter. Sanikidze converted a three-point play, but it didn’t take long for Sylven Landesberg, with his first points, to set a new game-high lead at 66-45. Eze, with a three-point play, and Matt Janning from downtown at the buzzer narrowed the gap to 69-53 through three quarters. Eze threw down a monster jam and added another bucket in the paint as Siena refused to quit. 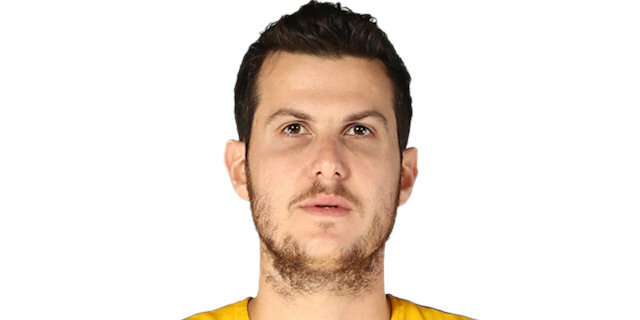 It took nearly three minutes for Maccabi to open its fourth-quarter account, but it did so in style with a basket-plus-foul from Pnini. Ohayon buried a jumper to keep the local fans singing. 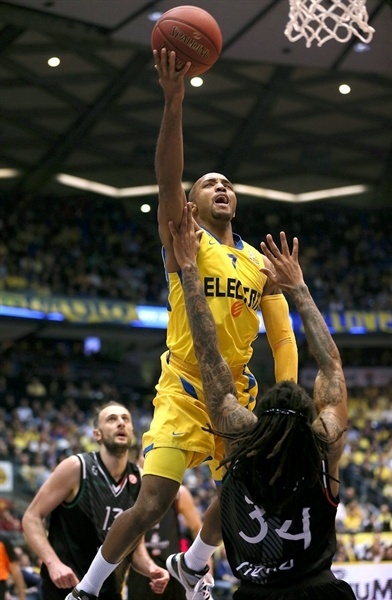 James tacked on another block before Smith buried a triple to restore a 20-point Maccabi lead. Pnini extended the lead to 79-57 from the line. James went to the bench to a standing ovation from the crowd. Smith connected from downtown for the fifth time and Pnini added more free throws to make it a 27-point game. Logan and Landesberg completed a 21-0 run before Janning ended an eight-minute Siena drought. 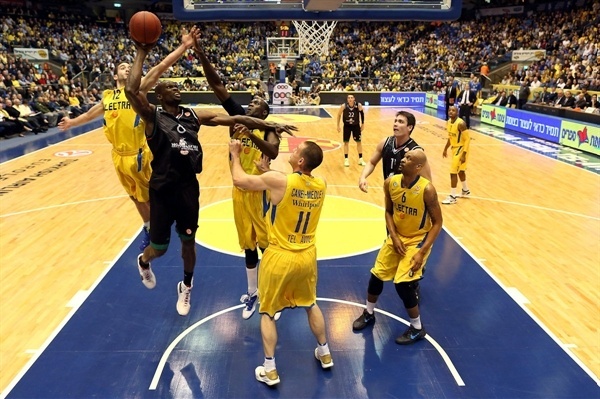 By then the outcome was a forgone conclusion as Maccabi celebrated an important win. "We've been through a lot lately. We couldn't connect four good quarters until tonight. Today we played much better and that's against the second ranked team in our group. Already before the game I knew we could play this well. I'm happy we managed to do that tonight and hope we'll know to do that again in the next games. We have to keep this momentum going." 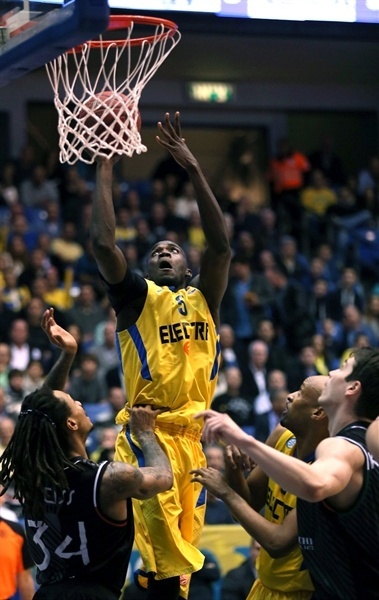 "Congratulations to Maccabi for a great win. We predicted it was going to be a very difficult game for us. To match up with their energy and enthusiasm was very difficult. I was sure the game would be like this because Maccabi saw us as a team in the top of the standings that they have to beat. If they play like this in the next games, they will get many more wins. They dominated the game in all parts of the court. They made very good choices, and played with a lot of energy. We struggled a lot against their pressure. At the beginning of the last quarter we had a small chance to come back, but then Maccabi recovered and we lost. Our trip until the end of the Top 16 will be very tough. 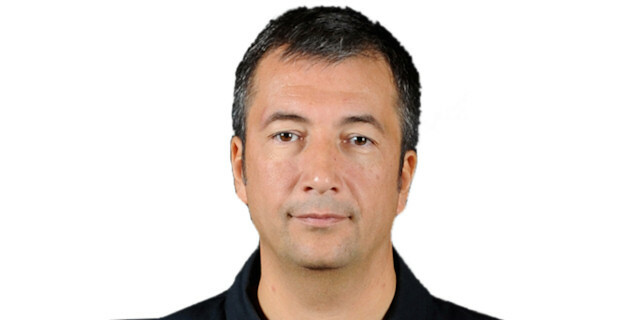 Our reputation is different now and we are a target for all teams. We need to take this game as a good lesson for the future." 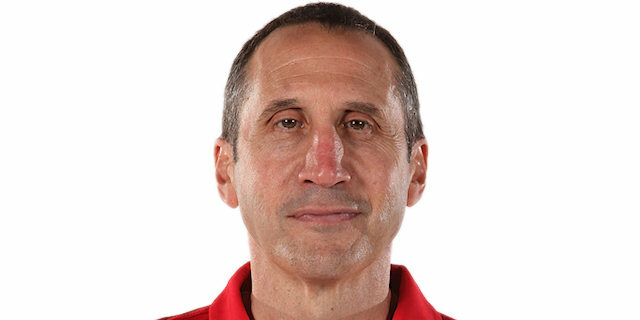 "It was a great game. Everybody played well tonight and that's the way to get wins in the Euroleague. We owed our fans such a performance and I'm happy we showed them we can also win big win as we did tonight. Montepaschi is one of the top teams in the group and it's a good sign we managed to beat them, and also in such style. We will try to take this win and carry this shape for the upcoming games." "Maccabi played much better than us today. They were very aggressive right from the start and we didn't respond the way we should. We need to learn from this loss and get back on the winning track starting next week."